For their Fall 2009 collection, Guerlain has added a brown eyeshadow quad to their collection. When I first saw it, I was a little taken aback. Brun Mordore looks like a little box of chocolates! There are 4 brown toned eyeshadows in this quad, which is similar in style to the Perles d’Argents quad. Unlike the Perles d’Argent quad, there is no strange matte shade – all 4 colours have shimmer and are very pretty. However, I find myself using only 3 shades mostly. The brown in the lower left is a little warm while the other 3 colours tend to be on the cool side. So, I end up using the other 3 colours more often. The colours feel a little hard to the touch which is quite typical of Guerlain eyeshadows and they swatch a little sheer. I might be mistaken but doesn’t Guerlain already have a similar coloured eyeshadow quad? Its a very basic neutral-brown eyeshadow quad that I’d expect any brand to come up with at some point in their lifetime. 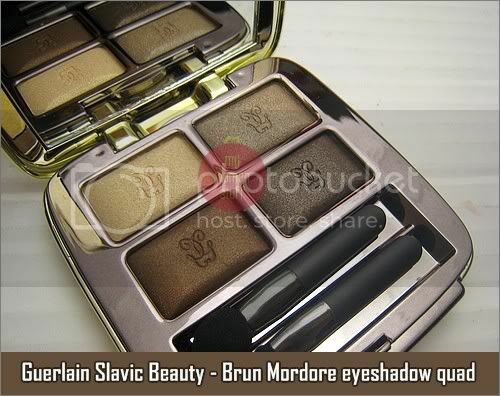 So quite aptly, Brun Mordore is a permanent item in the Guerlain stable. Initially, I was quite stumped by this quad. I don’t work well with brown eyeshadows. However, because 3 of the colours are cool toned, I found I could pull them off for very neutral eyes. The shimmer isn’t all that dramatic and all it does is add a pearlescent sheen to the eyelid. Its all very natural although you could up the ante for nights by packing on the dark shade. The darkest shade is a very pretty colour although it might have been prettier had the texture been softer and less sheer. You could pull off some serious smoky eye looks with this one. When I saw the name “Brun Mordore” the only thing I thought of was the Lord of the Rings. To recollect, Frodo had to go to Mordor to destroy the One Ring. Searching on Google produced some vague meaning of Mordore as “red-brown with gold” and pages of references to the Lord of the Rings, but I could not find any firm references on colour. PREVIOUS POST: President Obama’s Jeans Considered : Do you dress for fashion or for comfort? 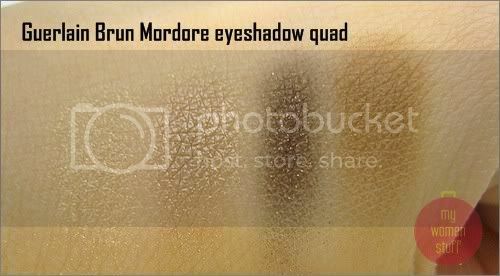 LOL you do think about Lord of the Rings with the palette name? It never crossed my mind coz your eyes are FAB! I call it the FAB Palette and your eyes are to die for with the gorgeous shades! glad you did this review! comfirmed my suspicion of its sheerness. it looks very sheer on you, even with the darkest shade. it will not work for me at all them even though i love browns especially chocolate ones. and you said it was hard to the touch. grrr. $$$ saved! thank you! i nearly bought the other LE quad! I don’t think Guerlain shadows work with you actually – they are too sheer for your style 🙂 But they do look so pretty yes? I remember in another comments section you wrote about how grays are more wearable than brown… I tried it but I don’t think I suit it at all! Just realized I am a ‘warm’ rather than ‘cool’ … so I may stick to brown so I’m on the hunt for some nice browns! I guess I’ll have to pass this palette since you say it’s more cool tones; but it’s so beautiful. Would you have any recommendations on ‘warm’ brown palettes? Thanks so much! Thanks for the review. The palette looks pretty and the colors look beautiful on you. But I’m not a fan of sheer eyeshadows, so I think I’ll pass. hehehe you got me curious and I googled. “Mordoré” simply means “golden brown” or bronze. Since brown golden brown is silly, i’m guessing it’s brown bronze? Yay! Coming from a French speaker I guess you’re the best to know! Thanks!